An refreshing real food dip for savory Garlic Sweet Potato Fries. For the Fries- Preheat oven to 400 ℉. Wash and peel sweet potatoes. Cut into 3/8 of an inch steak slices and then into 1/4 of inch fries for a smaller fry or 1/2 inch for a larger fry. Place into large mixing bowl. Measure and add olive oil. Peel and crush garlic over fries. Stir thoroughly so oil and garlic covers uncooked fries evenly. Place parchment paper over top of 2 cookie sheets and spread fries over paper making sure to not over crowd fries. Sprinkle Salt & pepper to taste. Bake for approximately 40 mins or until desired crispness. Let cool for a few mins before eating. For the Dip- In a medium size mixing bowl, measure all ingredients and mix well. Refrigerate until needed. 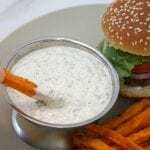 To make dip into a ranch dressing, add 1 tbsp of organic buttermilk at a time until desired thickness.